AA47: Veris Motion Sensor Local Load Power Pack. 120/277 VAC, UL, RoHS. AA48: Auxiliary Relay to expand the switching capacity of the AA47 Motion Sensor Local Load Power Pack. UL, RoHS. 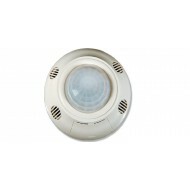 MSCP1000: Veris Lighting Control Sensor, Ceiling Mount, PIR sensing technology,1000 square feet coverage. Best for conference rooms, classrooms, and other general applications. 24VDC input. UL.